About 267,800 Michigan policyholders will be affected by a handful of insurance companies’ rate adjustments that will take effect over the next two months, according to rate filings made available by state insurance regulators. Not all policyholders will see the same fluctuations. Even though a company’s customer base may see an overall increase in prices, that is on average, and some customers may actually see lower prices based on their driver profile. The biggest overall change will be seen by Grange policyholders who are covered through the company’s PinPoint auto program. About 27,400 of them will see revised rates starting the first of the year. At that time, prices will increase by 12.4 percent overall. The change will bring in an additional $5.14 million for the company, amounting to an average $187 annual increase for each affected policyholder. Another 7,190 Grange policyholders will see an overall 4.5 percent increase in rates; that increase applies to customers insured through the Grange Mutual Auto program, not the PinPoint program. The change goes into effect only for renewing policyholders on the first of the year and will end up costing each affected policyholder an additional $86 a year, on average. 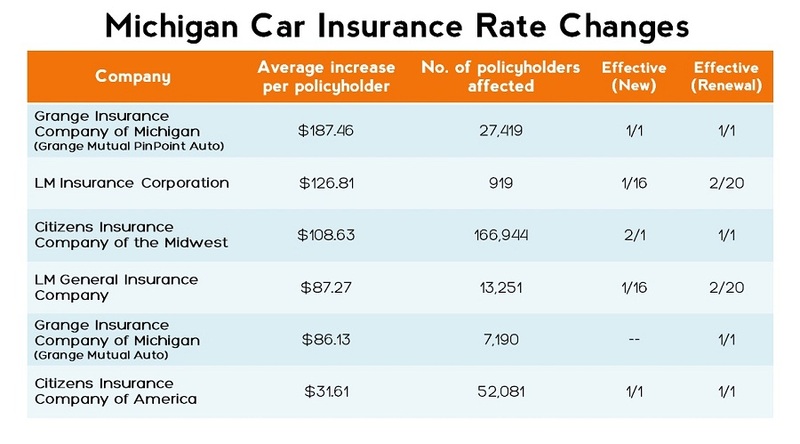 Citizens Insurance Company of the Midwest will be implementing Michigan car insurance rate changes that will affect nearly 167,000 customers. Rates will be raised an overall 6 percent, which translates to an average $109 increase a year for each affected policyholder. The change goes into effect Jan. 1 for renewing customers and Feb. 1 for new customers. For 52,000 policyholders at Citizens Insurance Company of America, rates will be rising by 4 percent overall starting Jan. 1. This is the smallest of the major rate changes going into effect in the next two months. It will cost the average policyholder affected by the change an extra $32 a year.